“Christopher Robin” is a deep and meaningful movie that explores the dark sides of adulthood. 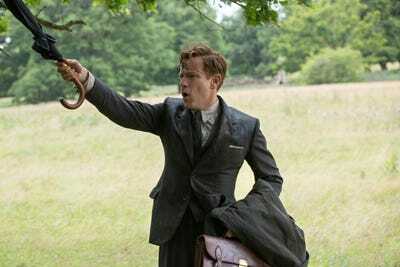 Ewan McGregor brings his irresistible charm to his performance as an adult Christopher Robin. Its first hour is really, really dark. If these characters mean anything to you, you will cry a lot. The animated stuffed animals look incredible. Adults, you’ve been warned: Bring a bucket (for tears) to “Christopher Robin” this weekend. “Christopher Robin,” a movie I wept through, is directed by Marc Forster (“Finding Neverland,” “Quantum of Solace,” “World War Z”). It stars Ewan McGregor as Christopher Robin alongside Hayley Atwell and incredibly designed and animated stuffed animals. It is a dark (both visually and thematically) weep-fest that is heavy on Eeyore. Thanks to its impeccable visual effects and McGregor’s necessary presence, it is an excellent movie for those who are connected to A.A. Milne’s quirky characters from the Hundred Acre Wood. The film’s first hour, which focuses on Christopher Robin in his adulthood (he works for a luggage company and doesn’t make enough time for his wife and daughter) is quite unnerving and has an unexpected war scene. It’s meaningful and tragic for the adults like me who relate to him, but probably boring for kids who don’t understand the context. DisneyEwan McGregor is a gift to us all. Through some honey magic or something (it’s cute and doesn’t need an explanation), Pooh and Christopher reunite in a park in London. McGregor – who is truly the heart and soul of any movie he’s in, including the “Star Wars” prequels – captures Christopher Robin’s distaste for Pooh’s sudden intrusion, as well as a conflicting need for Pooh at this horrible period in his life. The two go on a journey throughout London, which is where the joyful comedic elements of the film start to sprinkle in and bring it a little more life. But it’s not until the whole gang (Pooh, Eeyore, Tigger, Piglet, Kanga, Roo, Owl, and Rabbit) reunites with Christopher Robin that the movie picks up. His guilt for abandoning Pooh for so long brings him back to the Hundred Acre Wood to help him find his friends, who are apparently missing. After Christopher Robin convinces them he is not a Heffalump with the help of Eeyore – who is used so well and as often as the film’s dark tone suggests – they’re all reunited at last. DisneyEeyore (voiced by Brad Garrett of ‘Everybody Loves Raymond’) gets plenty of deserved screen time. From then on, you’ll cry nostalgic, happy tears instead of tears about how dreadful adulthood is. When I tried to describe the movie’s tone to my colleagues after I saw it, I said, without really thinking: “It’s like, ‘Paddington’ but ‘Dunkirk. '” And that’s not an insult: a live-action movie featuring A.A. Milne’s beloved characters wouldn’t have worked any other way. Both of the iridescent “Paddington” films exude brightness and pure joy, even in the sequel’s villain, played by the charming Hugh Grant. And that makes sense for that character. But “Christopher Robin” focuses on the dark but meaningful themes that many overlook in Milne’s work because of the goofy (but mostly great) animated Disney Winnie the Pooh shows and movies that defined many childhoods. Milne’s characters represent adult themes, and the screenplay reflects this: Eeyore’s self-deprecation and depression, Piglet’s crippling anxiety, Pooh’s somehow wise idiocy, and Tigger’s ego.